This is the largest city and is situated close to the tourist resorts in the Swiss Alps and mountain scenery. It is often referred to as the "portal to the alps". Geneva is centre of arts and culture and is one of the world's major centres of international diplomacy. A must see in Geneva is the monumental Jet d'Eau; a fountain of water pumped 140m into the air. The Swiss capital features an amazingly well preserved old‐town which is on UNESCO list of World Cultural Heritage sites. The view from the top of Monte Brè, east of Lugarno. Switzerland's third most populous city which features a number of heritage sites. Lausanne is situated on the bank of Lake Geneva (Lac Léman in French) in the middle of a wine region. It boasts a dramatic panorama over the lake and the Alps. 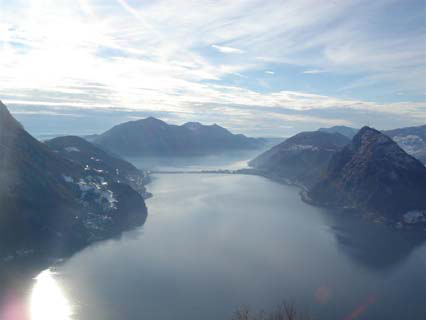 The city lies on Lake Lugano and is dubbed the "Monte Carlo of Switzerland" because of its warm summers and the fact that recently it has attracted an ever growing number of celebrities, entertainers and successful athletes.